The global halal market is set to grow at an exponential rate driven by increasing demand from the Muslim as well as non-Muslim population. Figures show that the global halal market size is expected to reach US$9.71 trillion by 2025, with countries such as Malaysia, set to lead the pack over the coming years. According to the ‘State of the Global Islamic Economy Report 2018/19’ by Thomson Reuters, in collaboration with DinarStandard, with 1.8 billion Muslims, and Muslim spend estimated at US$2.1 trillion in 2017, the Islamic economy continues its steady growth. SOURCE: State of the Global Islamic Economy Report 2018/19. It also noted that the global Muslim spend across lifestyle sectors was US$2.1 trillion in 2017, while the Islamic finance sector has US$2.4 trillion in total assets. It added, food and beverage leads Muslim spend by category at US$1.3 trillion, followed by clothing and apparel at US$270 billion, media and entertainment at US$209 billion, travel at US$177 billion, and spending on pharmaceuticals and cosmetics at US$87 billion and US$61 billion respectively. As the global halal industry grows, Malaysia continues to cement its status as a global leader in the halal industry as according to the Global Islamic Economy Indicator (GIEI), for the fifth year running, Malaysia overall has the leading Islamic economy ecosystem. “Malaysia has long ago taken important steps to establish a world-leading Islamic economy ecosystem, led by its robust and comprehensive halal standards, but supported by an extensive ecosystem that spans its halal free zones (halal hubs), well-developed halal products manufacturers, a strong Islamic finance industry, and a robust investor ecosystem that includes private equity, venture capital and sovereign wealth funds. “Malaysia’s lead in the past year has been maintained, with important steps taken to strengthen its role in the global regulation of halal products, with its establishment of an International Halal Accreditation Board that seeks to address short-term profit seeking among certifiers. Aside from that, Malaysia’s reputable certification has also made it an ideal choice for businesses from other nations to access the international halal market and as such, the government has been urging local businesses to utilise of the country’s advantage in the global halal industry. “Malaysia’s halal certification, recognised at the global level, should be used to entice more local and foreign companies keen on capitalising on that advantage. “Malaysia has been involved in the halal industry for a long time but was too focused on selling halal products without considering its expertise in the process of achieving the halal status. “We cannot focus only on promoting halal food products as before. Instead, we need to be more aggressive to enlighten the industry players on the halal certification process, in which we possess recognised expertise,” Minister of Entrepreneur Development Datuk Seri Mohd Redzuan Yusof said at the soft launch of the Malaysia Halal Expo 2019 (MHE 2019). In addition to its infrastructure, he pointed out that Malaysia could attract more businesses to expand here and create more economic opportunities through its expertise as well as capability in positioning itself as a global halal hub and a better understanding on the halal process. As the global halal industry continues to expand, there still remains the issue of a uniform halal certification, regulations, and other matters that need to be iron out in order for the industry to grow further. With several major events set to happen in the next few months that could highlight these issues, BizHive Weekly takes a look at updates in the industry. When it comes to the term ‘halal’, food and beverages (F&B) are often associated to the awareness and observance of ‘halal’, making its compliance vital to most countries looking to hop on the lucrative halal market. Besides the finance sector, the F&B sector makes up a huge portion of the Islamic economy. 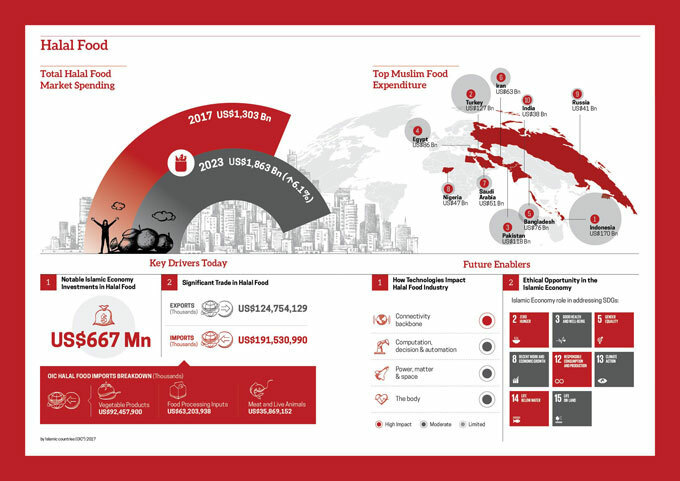 According to the ‘State of the Global Islamic Economy Report 2018/19’ by Thomson Reuters, in collaboration with DinarStandard, the halal food industry totals to US$1,303 billion in 2017 and that amount is expected to grow by 6.1 per cent to US$1,863 billion by 2023. “With 1.8 billion Muslims, around one-quarter of the world’s population, there is substantial potential to produce halal F&B,” the report highlighted. The opportunity has also been seized globally, by Muslim and non-Muslim companies and in some cases, some prominent halal food products are being produced in non-Muslim countries such as Brazil, China and more. According to the report, moves are underway to create that ‘kulu halal’ ecosystem, which in line with the globalisation of food production is having a global knock-on effect. “Saudi Arabia, for example, has toughened requirements for halal, which threatens Brazil’s ability to export meat to its largest export market in the Middle East. Meanwhile, Indonesia is planning to implement mandatory halal certification by 2019, although is struggling to put the process in place precisely because so much food and other products are globally sourced,” it added. As more Organisation of Islamic Cooperation (OIC) and non-OIC nations grow increasingly aware of the benefits and opportunities in the halal industry, regulation as well as a uniform certification are still a big concern in the industry despite its growing popularity. “Halal certification is a necessary operational step to addressing Muslim needs, but remains a challenging, complex process,” Thomson Reuters’ report highlighted. “Halal falls below global best practices due to a lack of commonly accepted standards among certification bodies globally, often times resulting in duplicate certification costs and added complexity,” it added. According to the report, there are also over 300 officially recognised certifiers globally, but there remains limited oversight by impartial accreditation bodies, leaving substantial room for misrepresentation. The report also highlighted that the lack of global alignment on certification increases costs and could destroy value. Nevertheless, over the last few years, there has been a number of initiatives launched by several OIC countries to raise the overall standards in the halal F&B industry. Earlier last year, taking a step to establish a greater collaboration between different halal bodies worldwide and in a step towards a meeting a mutual standard, Malaysia launched a new international association called the ‘International Halal Authority Board’. Headed by the Department of Islamic Development Malaysia (Jakim), the association is expected to serve as a platform to harmonise global halal authorities and certification bodies. For companies in Malaysia, there countless opportunities for those exploring ways to market their products in the halal industry. Given the country’s reputation in the global halal industry as well as the government’s support of the growth of the halal industry, companies here can thrive if given the right push. The halal industry is also no longer limited to just F&B as globally, demand has been growing in other industries including cosmetics, pharmaceutical, and fashion. During the ‘Halal Pharmaceutical Forum’ held last year, CCM Duopharma Biotech Bhd (CCM Duopharma) highlighted the global halal product market is currently dominated by four main sectors namely food, pharmaceuticals, cosmetics and others. It pointed out that pharmaceuticals account for 26 per cent, the second largest sector after food with 61 per cent and cosmetics with 11 per cent, as consumers grow increasingly aware of what goes into their bodies. “Driven by growing demand, the deepening and widening of the sector, the halal pharmaceutical industry is expected to grow eight per cent year-on-year to USD$132 billion by 2022,” it added. “Global communities are increasingly more discerning and demand that only the purest and the best ingredients are used in the making of pharmaceuticals.” said CCM Duopharma group managing director Leonard Ariff Abdul Shatar. He further highlighted that the market potential may be even greater as it is not just exclusive to Muslim communities. “It has gained increasing acceptance among non-Muslims too who associate halal with ethical consumption just as other values such as social responsibility, stewardship of the earth, economic and social justice, animal welfare and ethical investment – in short beyond their religious compliance,” he added. CCM Duopharma, which is the first company to obtain halal certifications for its range of prescriptive medicines, said: “The strong demand for halal pharmaceuticals provides great potential for the industry to tap into. “The growing range and options in halal pharmaceutical products have elevated pharmaceutical players to become more competitive in penetrating the global Halal industry”. 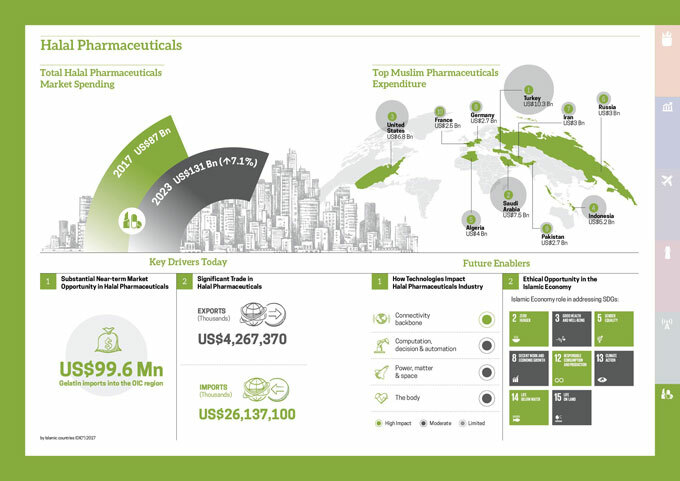 Change is also afoot with the halal pharmaceutical ecosystem taking major strides forward over the past few years, Thomson Reuters said in its ‘State of the Global Islamic Economy Report 2018/19’. It pointed out that Malaysia’s Halal Industry Development Corporation (HDC) is currently compiling the first halal pharmacopoeia, while JAKIM is set to introduce halal certification for medical devices, including liquids for dialysis machines. Regionally, it noted that Malaysia and Indonesia are working to standardise the sector at the regulatory level, setting an important example for the rest of the world. Malaysia International Halal Showcase (MIHAS) 2019 is the go-to exhibition for those looking to market their products overseas or to observe the halal export market. An annual trade exhibition held in Kuala Lumpur, MIHAS is hosted by the Ministry of International Trade and Industry (MITI), Malaysia, and is organised by the Malaysia External Trade Development Corporation (MATRADE). The trade exhibition will see more trade visitors worldwide, converge in a single venue to explore business partnership opportunities available in Malaysia through the halal industry. Last year, MIHAS 2018 saw 21,000 trade visitors which resulted in total immediate and negotiated trade value of over RM1.52 billion. Sales from the exhibition component recorded an increase of 29 per cent to RM914.57 million compared to RM708.82 million in 2017, while the MATRADE’s International Sourcing Programme (INSP) generated sales of RM602.45 million, an increase of 99.5 per cent compared to RM301.99 million in 2017. The top performing sectors at MIHAS 2018 exhibition were prepared food (RM407.20 million or 44.5 per cent share of total sales), beverages (RM129.3 million or 14.1 per cent share), pharmaceuticals, toiletries & cosmetics (RM108.04 million or 11.8 per cent share), agricultural produce (RM68.53 million or 7.5 per cent share) and machinery & equipment (RM41.58 million or 4.6 per cent share). The event focused on seven key product and services clusters namely food & beverage, pharmaceuticals, cosmetics, finance, tourism, e-Commerce and logistics. Today, MIHAS is the premier event that is not limited to the Asean region alone but is also supported internationally by the participation of International Pavilions from countries across the globe. The exhibition is set to take place from April 3 to 5. In conjunction with MIHAS 2019, MATRADE is also holding its global business matching programme INSP. The programme is expected to match more than 400 Malaysian companies with 150 high quality importers from over 40 countries around the world. The programme is expected to be held on April 2. For something less more educational, the World Halal Conference 2019 (WHC 2019) centres around the theme: ‘Fostering a Robust Halal Economy: Global Integration and Ethical Practice to reflect upon the uncertainties raised in building the future of Islamic Economy’. This year, the conference is aimed at accelerating competitive and inclusive economies around the world by enhancing the understanding of potentials of an Islamic Economy; facilitating public-private collaboration to improve competitiveness and inclusive growth performance of particular economies and regions; building a foundation to network; and collaborating with stakeholders across the world even in countries where Muslims are the minority. “The halal industry has always been of paramount importance to Malaysia as a Muslim-majority country. “The Muslim population worldwide translates into a rising international demand for Halal products and services. Halal is accepted as a truly global industry and this ever-increasing globalization represents a vibrant opportunity for the global economy. “Nevertheless, it also presents several challenges, to do with global attitudes and rapid technological change; hence it causes important responsibilities concerning the ethical governance and its harmonised regulation worldwide. “With the current technology revolution, global integration becomes sudden and borderless. This is where by fostering a true halal economy, these challenges can be diminished. “The WHC 2019 would like to take realisation forward in demonstrating that the halal economy has a vital role to assume its potential within the wider global economic returns,” it said. Halal stakeholders from more than 50 countries are expected to be at the two-day conference starting April 3. Among attendees include Government and Industry Leaders, Halal Industry Players, Media, Academicians and Researchers as well as Business and Trade Associations. Held last week, the Global Blockchained Halal Industry Forum 2019 highlights the future of the halal industry and how technology could better enhance the growth of this industry. Themed ‘Digitalisation and The Halal Industry’, this international forum was a platform for the Halal industry stakeholders to better understand the impact of Blockchain Revolution and its technological advances on Halal business models and operating processes that involve supply chain, smart contracts, certification; which are vital to the Halal food, pharmaceutical, cosmetic and personal care, Islamic finance and travel industry. The participants were educated about how to adopt blockchain technology in the halal certification, syariah complied smart contract, the transparency and traceability of halal supply chain. On the same wavelength as pharmaceutical products, the cosmetics and personal care sector in the halal industry is also gaining popularity. “The popularity of halal cosmetics among millennials in Northern America, Europe, the Middle East and East Asia has prompted more market entrants and the expansion of established players seeking global market share,” Thomson Reuters shared in its report. 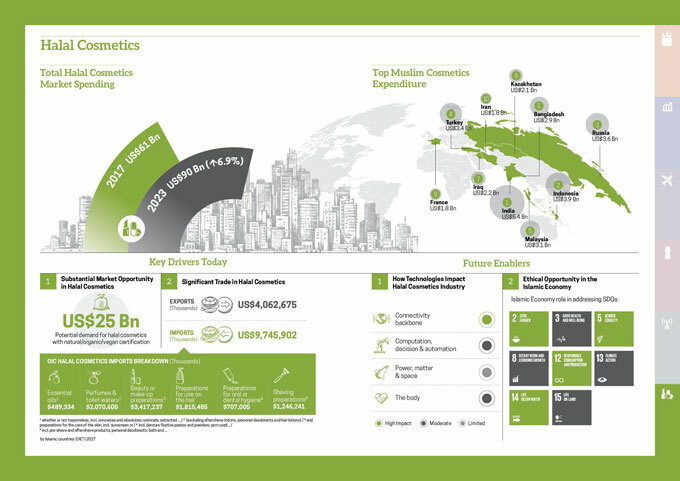 “While no regional or global halal cosmetics brand has yet to emerge, the segment is poised for significant growth, with Muslim spend on cosmetics currently worth US$61 billion in 2017, and forecast to reach US$90 billion by 2023,” it highlighted. In Southeast Asia, the region’s large Muslim population and high awareness about halal products has been driving demand, with compound annual growth rate (CAGR) of 10.2 per cent forecast between 2015 and 2020, according to FMI. By comparison, non-halal cosmetics sales are forecast at a CAGR of three to four per cent over the same period. “Over the past decade people have become more aware about halal, and have better access to information through the Internet, while the (growth of the) Islamic Economy is enabling more choice. “Previously, nearly all cosmetics were brand names from Europe and Japan but today there are good (Southeast) Asian halal brands,” Fazil Marican, founder of Singapore-based consultancy firm SimplyHalal was quoted as saying on a post by DinarStandard on Salaam Gateway’s Global Islamic Economy Gateway website. According to Salaam Gateway, lucrative halal cosmetics industry has seen growing demand which led local firms such as Wipro Unza (Malaysia) Sdn Bhd, Southern Lion Sdn Bhd, and SimplySiti Sdn Bhd to get halal certification. It further pointed out that multinationals such as Johnson & Johnson Sdn Bhd and Colgate-Palmolive’s toothpaste and mouthwash brands have followed suit, and Japan’s Shiseido Company has certified 28 halal products under its Za brand while South Korea’s Talent Cosmetic Co became the first Korean company to be halal-certified in Malaysia: making 147 out of its 550 cosmetic products halal. For Malaysia, being one of the leading nations in the halal industry and with its highly-regarded halal certification bodies, the country has an advantage over other regions when it comes to the halal sector. “Malaysia was one of the early movers in halal cosmetics when it actively stepped in to promote the industry around 15 years ago. “Sales and numbers of products have gradually risen since then, especially in the past five years, driven by greater adoption of halal cosmetics in Southeast Asia, where halal sales accounted for nearly 30 per cent of the overall market, according to research company Future Market Insights,” said Salaam Gateway. Nevertheless, it also pointed out that certification, while highly-regarded, remains an issue. 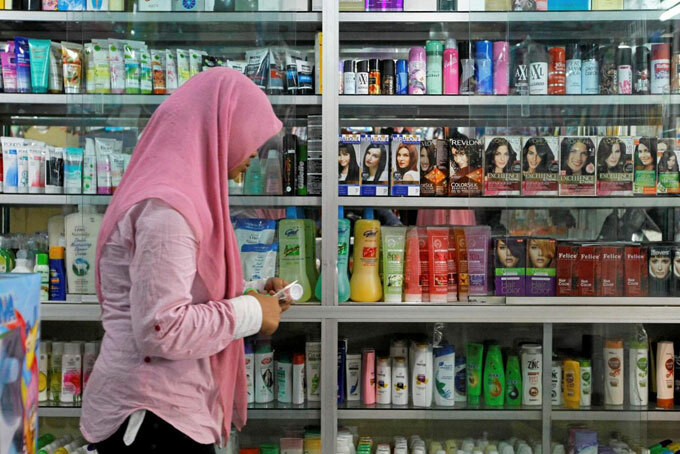 “The lack of a universal halal standard for cosmetics is hindering growth, and at the regional level companies also have to get local certification to export to different markets,” it said. However, it stressed that Malaysia is rising to the challenge by developing guidelines for halal cosmetics – a global first – similar to the MS2424:2012 Halal Pharmaceuticals General Guidelines.